On my first visit to new surf-themed restaurant Tower 12, the people next to us were actually talking about surfing. 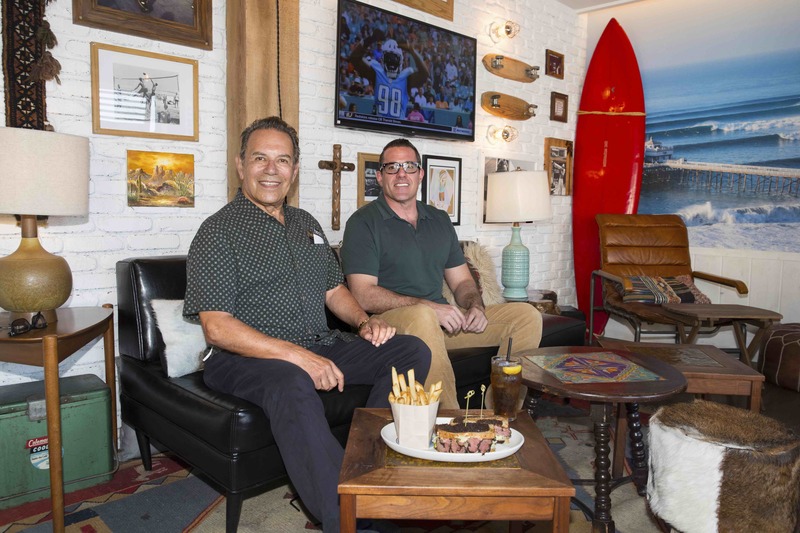 That was a novelty, because at many surf-themed restaurants the sport is a marketing gimmick to be appreciated or ignored by a clientele who have never surfed. I count myself among the latter, despite growing up in Manhattan Beach. I was a nearsighted kid who couldn’t wear glasses in the water, and kept getting bushwhacked by waves I couldn’t see. I do enjoy the funky style of surf bars and restaurants, which is particularly well evoked at Tower 12. The rear area is best. It resembles a rambling beach house decorated by somebody who takes to the water in between collecting tasteful tribal art and local history memorabilia. You might not know anybody who has a house exactly like that, but you’d like to. The menu is based on artisanal bar food like woodfired pizzas, things between buns, and some pastas. They do have some more interesting items, like smoked ribs and seafood entrees for those who crave something conventional and substantial. There’s enough variety that if you can’t find something that sounds at least a bit enticing, you don’t like food very much. In two trips I have tried one appetizer, the cauliflower tempura with spicy harissa and Greek yogurt, and two salads, the grilled ahi tuna Nicoise and the smoked chicken Waldorf. At one meal we also had one of the sides as an appetizer because it seemed like a good idea to start a meal with grilled broccolini with lemon, garlic, olive oil, and chili flakes. It was, but the cauliflower tempura is even better, thanks to the dipping sauce of yogurt with a little mint and garlic. The harissa, a North African sauce similar to Sriracha, will suit some palates but be too spicy for others. That hot sauce is usually served as a dollop on top of the yogurt, so you might ask for them to be served separately if you don’t have a taste for both. this is a Waldorf only if you really stretch the definition. Call it what you want, it’s very good. The Salad Niçoise is even better, the seafood and vegetable salad in an eye-catching presentation. 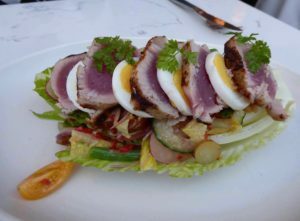 Some large Romaine leaves are made into a boat-shaped bowl and filled with green beans, boiled potato, bell pepper, and cucumber, with slices of seared ahi tuna and hard-boiled egg on top. The original Niçoise is made with anchovies but tuna is common, either canned or fresh, and there are some variants that are barely recognizable. At Tower 12 the flavor balance matches the classic, a rarity in an area where most eccentric versions lack the subtlety of the original. I enjoyed that salad with an Ironman cocktail, and on our second trip ordered another one because it was delicious. It’s a bourbon base with liqueurs and bitters served in a flask, and while the flask is a silly affectation the drink is excellent. The bar program by Greg Newman and John Fox has some superb items, and for my money this is the best mixology bar on the Plaza. The pizzas looked good but fairly conventional except for a Thai green curry shrimp that I fully intend to try. Our servers recommended three of their sandwiches and the smoked pork ribs, so we experimented with those, instead. The fried chicken sandwich with bacon was the most conventional idea but had interesting touches, like a tangy but not overwhelming chili slaw. It was more of a triumph of execution than creativity, but some days you just want a good chicken sandwich. The ahi tuna banh mi burger was more interesting but less successful even though the flavor combination was excellent. I enjoy Vietnamese-style sandwiches and making one with seared ahi is a great idea, but the sandwich was very overdressed and served on a bun that quickly became soggy. Traditional Banh Mi sandwiches are served on crusty French bread and lightly dressed, and it would have been better if that rule were followed. 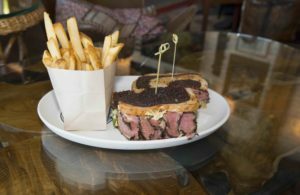 The best item I’ve had at Tower 12, and something unique in the South Bay, is the housemade pastrami sandwich on marble rye. Very few places make their own pastrami because it’s labor-intensive: the meat has to be soaked in brine overnight, coated in spices, smoked, and then steamed. The result when done right is spicy, tender, and nothing like the rubbery stuff you get in most deli cases. That’s generally all I can get locally and I am used to going to Langer’s Deli near Downtown LA when the craving gets unbearable. This is the best pastrami west of the 405 by far, and probably the best pastrami sandwich west of Langer’s, and that is high praise. At Tower 12 the sandwich also includes housemade Russian dressing, coleslaw, and Swiss cheese on decent marble rye, and though I prefer the traditional rye with caraway I’ll be back for this again and again. The same smoker that turns out that pastrami also produces ribs that are a near miss. The meat itself is moist and tender but we did not detect a spice rub and the sweet barbecue sauce has no tang of pepper, paprika, or cumin. If you like tiki-style Polynesian or char siu ribs rather than traditional American barbecue this may be your perfect rack of ribs, but I prefer a seasoning kick in mine. The sides include fries (skinny or fat, and both arrive hot and crisp), the oniony coleslaw that I enjoyed on the pastrami sandwich, and caramelized creamed corn with parmesan and mascarpone. That creamed corn was a novel idea and particularly good, and I’d recommend it and the garlic broccolini that we had sampled as an appetizer. Four desserts are offered, but we filled up on starters and mains on both visits. I’ve heard good things about the banoffee sundae, and though I’m not usually a fan of sweet desserts I’ll try to lighten up on the starters next time so I have room to experiment. The bill at Tower 12 is surprisingly affordable given the location on the plaza; you can get a sandwich or pizza, side, and a beer or some wine and be out the door for less than twenty-five bucks. You can spend more if you go for the seafood entrees and fancy drinks, but it’s praiseworthy that they have offerings up and down the spectrum. After being open for only a short time Tower 12 actually feels like the locals’ place that you might drop into after hitting the waves – or, like me, watching others do so with just a hint of wistfulness.